Comm Eye Health Vol. 30 No. 98 2017 pp 29-30. Published online 07 September 2017. Project Manager: Aravind Eye Hospital and Postgraduate Institute of Ophthalmology, Pondicherry, India and Fulbright Scholar, Hubert H Humphrey Fellow 2016-17, Rollins School of Public Health, Emory University, Atlanta, GA, USA. Programme Director, Seva Canada and Faculty of Medicine, University of British Columbia, Vancouver, Canada. There is limited evidence about what is the most effective and cost-effective strategy for screening school-age children. We compare different approaches and the components that are necessary for best practice screening. There is limited evidence about which strategies are cost-effective for screening visual acuity in school age children.2 The optimum age, number of occasions for screening, and VA screening threshold in different contexts have not been established in controlled studies. Each factor can influence the results of the screening test, but so far these factors have not been standardised and therefore comparison across programmes is limited. A few studies have evaluated methods within a single programme. The ACT study6 found more true positive children with a significantly lower proportion of false positive referrals (9.7% versus 16.7%). The same study showed that the all-class teacher (ACT) model significantly increased the number of children attending follow-up within 3 months compared to the select-teacher (ST) model. This study showed that a small change in the role of teachers improved the eye care of children while reducing programme costs. Another advantage seen with ACT screening compared with STs is a shorter time between screening and follow-up examination by eye care personnel. A major cost of school screening programmes is the time spent examining children who are referred for refraction after vision screening (the screen positives). The number of referrals is higher if vision screening is not done well (i.e., if there are many false positives) and if the screening cut-off is a relatively good level of VA, as the proportion of children in schools with this level of vision or worse will be higher. One study examined visual acuity testing at two different VA cut-offs/thresholds.5 At the 6/12 cut-off (poorer VA), the number of children correctly identified as needing help (the sensitivity) was the same as at the 6/9 level (better VA). However, there were fewer false positives (i.e. unnecessary referrals), which led the authors to conclude that it is preferable to screen each eye separately at 6/12. This reduced the number of referrals by about 50% compared with a 6/9 cut-off. However, further studies are needed to determine the optimal VA cut-off in each context. For example, if most teaching uses blackboards, which are often of poor quality, or if classrooms are poorly lit, a better level of vision would be required for distance viewing. In the Indian context, training teachers is typically carried out in two sessions. In the first session, ophthalmologists train teachers to recognise eye conditions in children such as squint, nystagmus, corneal opacities, ptosis, conjunctivitis and eyelid swellings. The teachers are also given posters and pictures. In the second session, optometrists instruct teachers in vision screening using eye charts. The teachers are equipped with Snellen screener charts (both number and tumbling E), 6 metre tape and data forms to record whether the child can or cannot see the optotypes with each eye. They practise on one another to standardise methods and to test reliability. Visual acuity is measured at 6 metres using a Snellen (or E) chart, asking students to occlude one eye at a time with an occluder. To limit memorisation, and to improve reliability, a tumbling E chart can also be used. Tip: Rotate the chart between eyes and between children. Only one student should be examined at a time; keep others outside the examination room. During screening, students should read the cut-off/ threshhold line only (6/12 or 6/9). High-contrast black on white should be used, with a dark surround, as this improves reliability when only using one row of optotypes (Figure 1). In summary, the limited evidence supports school screening methods using ‘all class teachers’ and failure to see the 6/12 (or 6/9) Snellen line in one or both eyes as the referral threshold for refraction. All children suspected of having other eye problems, regardless of their vision, should also be referred for examination. Compliance (spectacles + referral) After 3 months, visit schools to find out: Do the children have their spectacles? Are they wearing them? 1 Resnikoff S, Pararajasegaram R. Blindness prevention programmes: past, present, and future. Bulletin of the World Health Organisation 2001;79(3):222–6. 3 Lester BA. 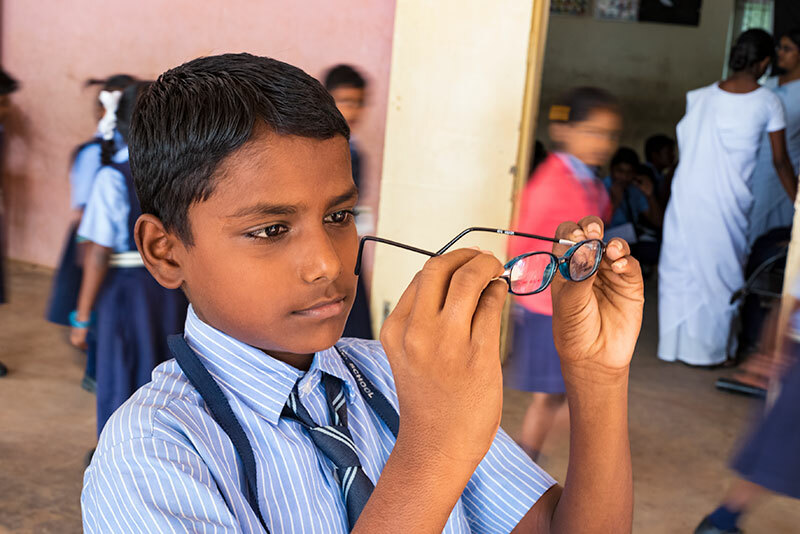 Comparing the cost-effectiveness of school eye screening versus a primary eye care model to provide refractive error services for children in India. Community Eye Health 2007; 20:15. 4 Jose R, Sachdeva S. School eye screening and the National Program for Control of Blindness. Indian Pediatr 2009;46: 205–208. 5 Rohit Saxena, P.V., Radhika Tandon, et al. Accuracy of visual assessment by school teachers in school eye screening program in Delhi. Indian Journal of Community Medicine, 2015. 40: p. 38-42. 6 Priya A, Veena K, Thulasiraj R, et al. Vision screening by teachers in Southern Indian schools: Testing a new “all class teacher” model. Ophthalmic Epidemiology 2015; 22:60-5. 7 Sudhan A, Pandey A, Pandey S, et al. Effectiveness of using teachers to screen eyes of school-going children in Satna district of Madhya Pradesh, India. Indian Journal of Ophth. 2009; 57:455-8.